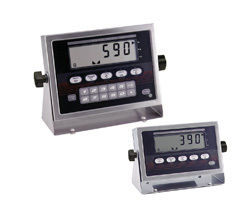 The IQ plus 390-DC digital weight indicator takes portability to a new level. Running on C-cell alkaline batteries, this handy indicator allows operation in practically any location imaginable! Topping rivals in ease of use and performance, it features battery life up to 300 hours and a configurable standby mode that conserves battery power when not in use. Operators can’t miss the IQ plus 390-DC’s prominent LCD display. Showing up to six digits in unmatched clarity, its huge, on-target design makes viewing easy to reduce costly operator errors. In addition, the IQ plus 390-DC’s six-button panel eliminates the hassles of setup and operation allowing even the most inexperienced operator to be immediately productive. Housed in a stainless steel, NEMA 4X/IP66 enclosure, the IQ plus 390-DC is designed to outlast any digital indicator on the market. From outdoor weighing systems and portable warehouse scales to material handling and food processing applications, its rugged construction stands up to repetitive use and environmental abuse. Additional features include a piece count mode that enables the IQ plus 390-DC to serve as part of a portable counting scale, an AC adapter for applications not requiring battery power, and RATTLETRAP™ three-stage digital filtering for accurate weight data in environments where vibration is a concern. To ensure stability when weighing animals, choose the optional animal weighing program. Add it all up and it’s easy to see why the IQ plus 390-DC sets the standard for portable indicators. It?s simply the first portable solution to deliver heavy-duty performance without a heavy-duty price.